The Hawks cruised into the Portsmouth Senior Cup final with a 7-0 win against Paulsgrove at Westleigh Park. Alfie Rutherford grabbed a hat-trick with Ed Harris, Ibra Sekajja, Theo Lewis and Ryan Woodford also finding the net. 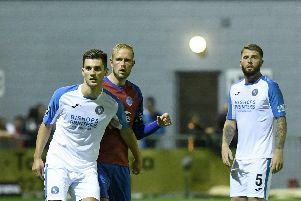 Jake Warlow thought he had grabbed a late consolation goal for the Hampshire Premier League team but the referee ruled it out. Baffins Milton Rovers and Horndean drew 1-1 at the PMC Stadium in the Wessex League premier division. After a goalless first half the visitors took the lead but Baffins equalised from the penalty spot. AFC Portchester’s Wessex premier game against Hamble Club at the Crest Finance Stadium was postponed due to a waterlogged pitch. On Monday night goals from Callum Glen, Dec Seiden (penalty) and Harry Potter earned United Services Portsmouth a 3-2 Wessex League division one home win against Newport IW.